Artificial Intelligence and Machine Learning are at the forefront of the technological revolution we are witnessing today. The number of individuals aspiring to become certified AI and ML practitioners has increased exponentially. There are a lot of institutes to choose from to learn AI, so making the right choice needs to be a calculated move. 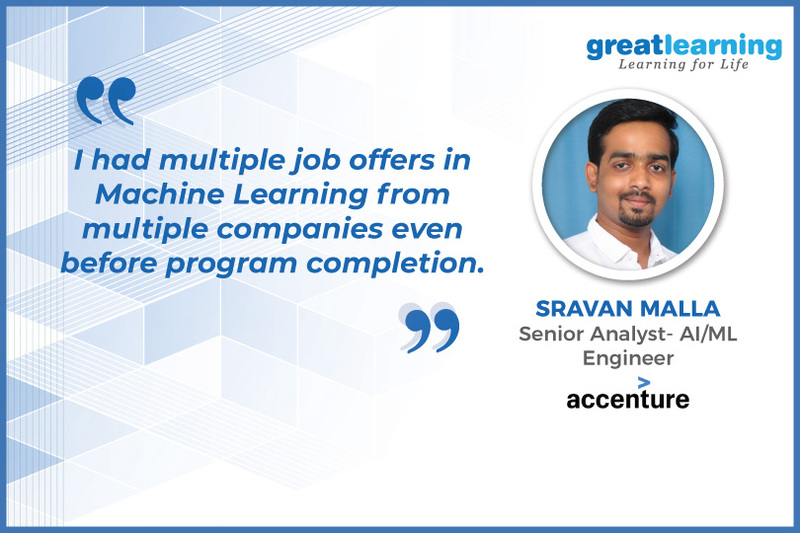 Read on to find out why Sravan Malla, our Machine Learning program alumnus considers Great Learning as the ideal choice. Why did you choose Great Learning to learn Machine Learning? I am a graduate in Mechanical Engineering and have started my career in IT as a Mainframe Developer, so the challenges began from then. Though I am having a good time working as a Developer at IBM, I was always encouraged to take up new responsibilities and got a chance to explore the area of analytics. I then developed an interest and started learning about analytics and always wanted to support my self-learning with a well-defined course curriculum; for which I explored and shortlisted few institutes. The curriculum of the Machine Learning program by Great Learning met my requirements and seemed promising. So, the reason I chose Great Learning. I had just three and a half years of experience when I took up this program but the way course is defined suits all levels of experience. Were the faculty approachable and knowledgeable? The class interactions are the best I can say. I was doing it all online before I enrolled for the program and personally, I felt that there are a lot of distractions in an online course and it can be challenging to reach out to the faculty directly. The professors who come to teach the machine learning program at Great Lakes are not any fresh college graduates. They are highly experienced professors and industry practitioners. I utilized the opportunity to interact with the professors to the fullest. I had a chance to hear from best professors like Dr. Srabhashi Basu, Dr. Narayana Darapaneni and Prof. Mukesh Rao who took most of our sessions and the best thing is even today, they are approachable. Did your career improve after you completed the program? The career progression did not happen just like that, it’s not a miracle. Before and along with the course, I had lots of homework. This course really helped me to do that homework in a proper manner and I got a chance to work in this area in my current company. Later when I was on the verge of completing the course, I had multiple job offers in the field of Data Science and Machine Learning from a couple of companies. I have accepted the role and decided to work with Accenture as a Sr. Analyst – AI/ML Engineer which looked more promising and was aligned to my career goals. I would like to thank Great Learning from the bottom of my heart for providing me with the required support and guidance throughout my journey and making this possible. From Day-1 of my journey, I believed that the Great Lakes Machine Learning program is the right choice for enhancing my skillset. Once again, I firmly want to say that I came to the right place and my career goals have been fulfilled because of the proper strategy, plan, course structure, and the excellent faculty which Great Learning had in place. Though I have utilized the resources to the maximum extent possible, I should say that there is still a lot more to learn and grow and just like Great Learning, I believe in continuous learning. Firstly, one must stick to the goal they set and avoid all the distractions, it might not be as easy as we say, but the results are a pay-off for all the sacrifices and hard work you put in. Sometimes, people or situations around may make you feel down, just ignore and keeping giving your best. Keep remembering the quote “Repetition is the mother of all skills” and feel proud to revise the concepts twice, thrice or until you feel you are comfortable. The one thing that should always keep you motivated was the zeal and strong will to be future-ready.